On some good days when my older one agrees to take some spicy paratha to school, I count my blessings :). Her specifications are clear - "I should not need any accompaniment, not even yogurt if I have to take it to school". To suit her requirements, I make this extra spicy Methi Paneer Paratha. I feel it is a wholesome and flavorful meal. I wish she would take some yogurt too but can't push my luck too far, Can I ? * Typically I would add a couple of pinches of kasuri methi in addition to the fresh methi leaves. Knead the dough with the whole wheat flour, turmeric, red chilli powder and salt with as much water as needed. Make sure the dough is not too tough to handle. Keep it covered for about 10-15 min. Meanwhile prepare the seasoning. In a heated pan, add oil and cumin seeds. (and kasuri methi, if using) and add it to the crumbled paneer. Add salt, red chilli powder, garam masala to the above mixture. Adjust the spices and salt as per taste. Knead well and divide the filling into 7-8 portions. Make equal portions of the dough. Roll out small chapatis and fill in a spoonful of the methi-paneer mixture, close the edges and roll out the parathas taking care that the mixture doesn't fall out. Shallow fry in a heated pan until both the sides are done. Repeat the procedure for all the parathas. Store in an insulated container until ready to serve. Roll/wrap them in paper towel and aluminium foil while packing. Serve with Yogurt or any gravy curry! Methi and paneer is a combo made in heaven for sure. ;-) Best way to sneak in the goodness of methi is by adding it with paneer. Yummy paratha Harini. Love the combo of methi and paneer. Glad that your kid agrees to take this for lunch even with some conditions :-) The paratha turned out so goo, Harini!!! Methi and paneer works awesome together and am sure this paratha is definitely my kind of food. Kids will thoroughly enjoy this parathas as they have paneer in it. Beautiful parathas there. Filling and yummy paratha!! Adding paneer and methi together is an awesome idea!! Love that combination. I am sure it tastes fantastic. Even I can have this without any side dish. Yum..
Paneer and methi combo stuffing is really flavorful besides being nutritional. The stuffed roti sounds a fantastic lunch box item. Wow Harini, methi and paneer combination for parathas. A great recipe. Book marking it. That combination sounds so perfect Harini and if kids can carry this for their lunch, nothing like that!..I must try this sometime..the parathas look so nicely done and I love the even cooked look your parathas have..so yum! Paneer & methi sound like a delicious combination for a paratha. Looks perfect to be packed for lunch. 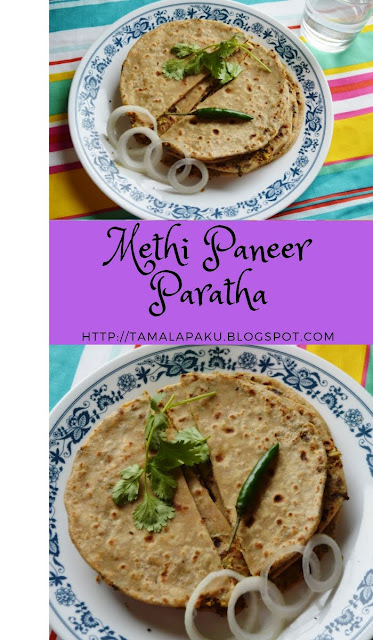 wow methi and paneer is such a delicious combo, The paratha looks super scrumptious and making me hungry.. Sure they are scrumptious as it is ,I always love stuffed parathas as it is with no accompaniment. You have perfectly rolled them harini , Love how you stacked them !! Onions and chillies are just enough to enjoy these stuffed parathas..
Methi and paneer together sounds interesting, I usually add potato with methi to stuff in the paratha, will try your combo the next time I GET MY HANDS ON METHI LEAVES. Harini,My kids would rather take a side and a less spicy chapathi!!! MEthi and paneer in roti is always yum! Love the combination methi and paneer in stuffing.. healthy breakfast recipe.